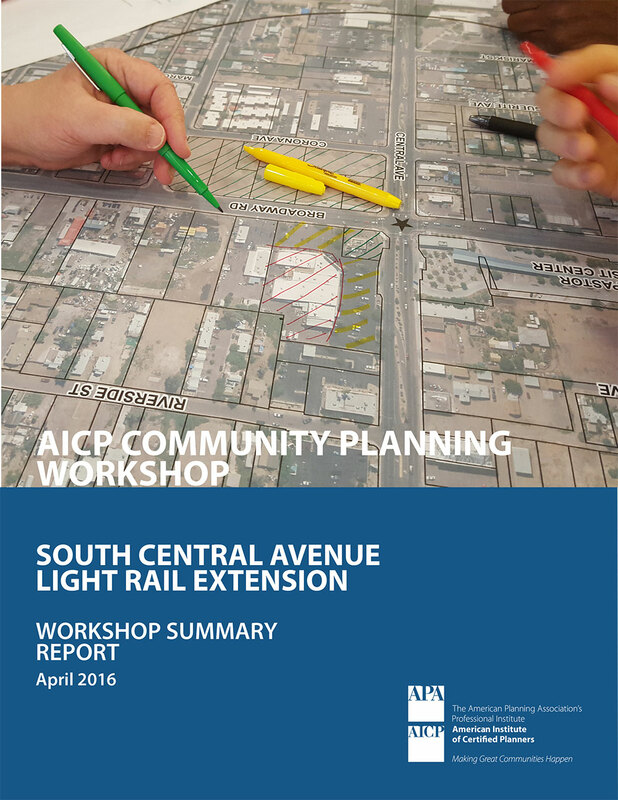 The 2016 AICP Community Planning Workshop was held during the 2016 APA National Planning Conference in Phoenix. Conference attendees registered for the event to work alongside South Phoenix community members, local Phoenix planners and other city staff, elected officials, area stakeholders, and fellow planners from around the country. The workshop was organized primarily by City of Phoenix Planning and Development Department staff with support from APA staff to coordinate the event. The workshop brought together members of the Central City and South Mountain Village Planning Committees, residents, and business owners with more than 20 professional planners from across the country to focus on land use planning for potential future growth along South Central Avenue. The purpose of the workshop was to identify areas ideal for preservation, retrofit, or growth within 1/4-mile of each future station area by building on recently established place types and discussing potential challenges and assets at each locale to further community revitalization goals within the light rail corridor. South Central Avenue is an important link from downtown Phoenix to the south side of the city, including the new Rio Salado Habitat Restoration Area and South Mountain Park — the largest municipal park in the U.S. Plans for the next light rail extension will follow South Central Avenue.